800% BS. Some (but not all) circuitry is much more forgiving than is claimed. You can use "dead" batteries in flashlights if you can live with the lower light output. A 1.3 volt cutoff is at the high end of the scale. Could something like this extend battery life? Yes, but with caveats. I would expect to be able to get up to a useful extra 75% of the normal lifespan - in a circuit that doesn't already have a voltage regulator, and one that doesn't include a motor. Battery capacity is measured in amp-hours. Discharge curves show how they behave under various loads. In the case of batteries powering a wireless keyboard, the draw is so light that when the voltage begins to dip significantly the battery is nearly empty. In cases of heavy draw, voltage drops quickly even though there is plenty of power left in the battery. Such circuits usually specify a larger battery to reduce that effect. One thing to remember with voltage regulators is that when you increase the voltage, you reduce the available amperage. That will work against you with devices like DC motors. When the voltage is reduced on a DC motor, the amperage will increase and the motor will "lug down" and increase torque, even while rotating more slowly. That was a prime part of the "balancing speed" in streetcars and trolleys. One with a voltage regulator will have little torque. Many circuits will just not work if amperage is too limited. 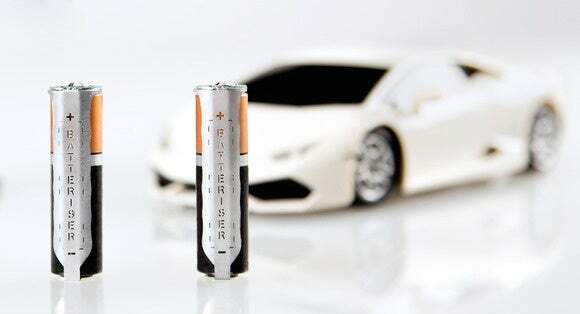 You can actually recharge disposable batteries if you know how to (don't try this!). A very low trickle-charge, over an extended period, will bring disposables back up to nearly-new voltage levels. This gadget may work, but I suspect nowhere near as good as advertised. If memory serves, there was a device released by one of the major battery makes that did just this. Time period earlier 90's. As I recall it was a trickle charger. My google search yielded a lot of battery chargers of one sort or another. If memory serves, there was a device released by one of the major battery makes that did just this. Time period earlier 90's. As I recall it was a trickle charger of on kind or another. Yes it was for double and triple A batteries, and was NOT a car battery charger. I just use a low-current, cheapo battery-charger to recharge my disposable AA/AAA batteries.....never had a problem. We had one. It worked, but required patience as it took a long time.